Don’t look for fancy solos here, but make sure you bring your dancing shoes with you! 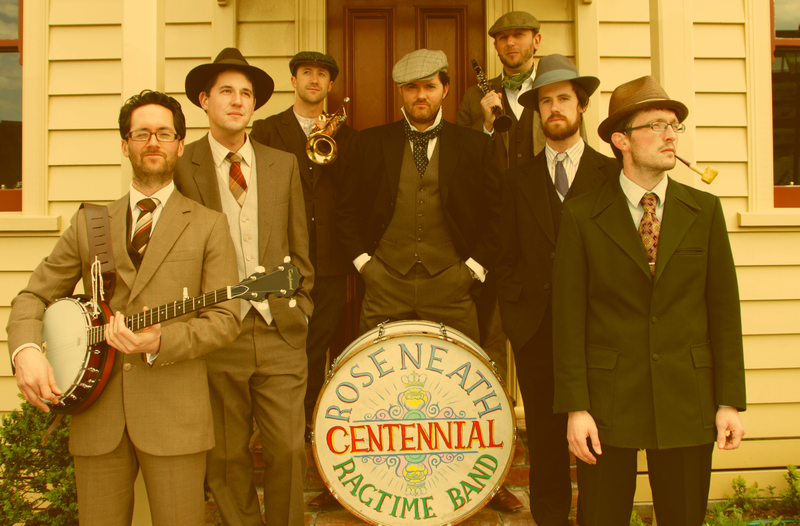 Hailing from the windy city, Wellington, New Zealand, the Roseneath Centennial Ragtime Band was formed in 2011 by Dayle Jellyman and Mike Jensen. Paying dues to legendary musician, Louis Armstrong and the New Orleans’ jazz and blues tradition from the early 1900’s, the Roseneath Centennial Ragtime Band bring back to life the music that filled the saloons, brothels, sporting houses and juice joints of this bygone era. The Roseneath Centennial Ragtime Band is all about playing music that gets people up and moving, don’t look for fancy solos here, but make sure you bring your dancing shoes with you! Having started out playing traditional tunes and arrangements of common ragtime and early jazz standards, they’ve moved towards playing entirely original music, serving up their our own version of gumbo, cornbread and collared greens, Roseneath style!